My wife using the ChuckIt Tennis Ball Launcher for the first time. 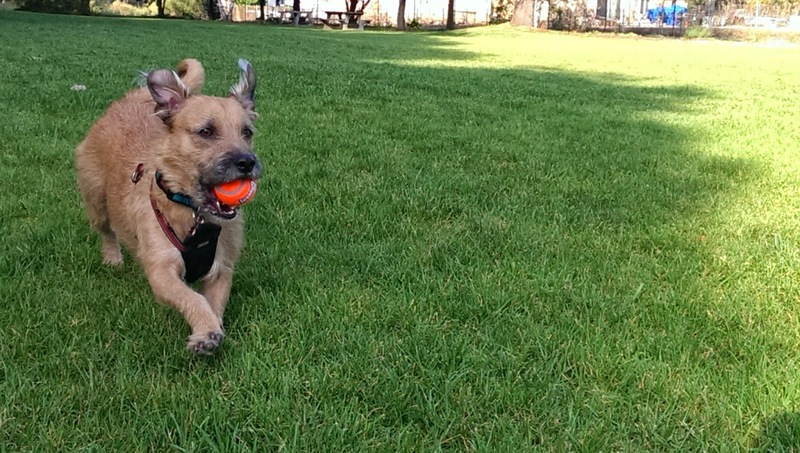 My terrier mix, Benji, loves fetch. Seriously. Loves. It. Close-up of the ergonomic control grip. When a guest visits our home, Benji brings his ball over and drops it in their lap to initiate play. It's a nice gesture, although not everyone appreciates getting dog slobber on their clothes when they first arrive at someone's house. If I work late and don't take Benji for a walk or to the park for fetch, he'll bring his ball into our bedroom, jump up onto our bed and drop it on my chest. This makes me feel like a crappy dog owner because I've neglected to give my dog the exercise and attention he requires. Of course, I know that's not true—like many "pet parents," I treat Benji like he's one of my children. My wife jokes I love him more than her sometimes. In any case, in the aforementioned scenarios, I'll usually take Benji's ball away and put it on a shelf so he'll stop pestering me and/or my guests and give him a bone or chew toy to work on. I also have a 1 1/2 year old daughter who touches everything she can get her grubby little hands on, including Benji's slobbery toys. Carrying her around, lifting her into a high chair, etc. does a number on my back. 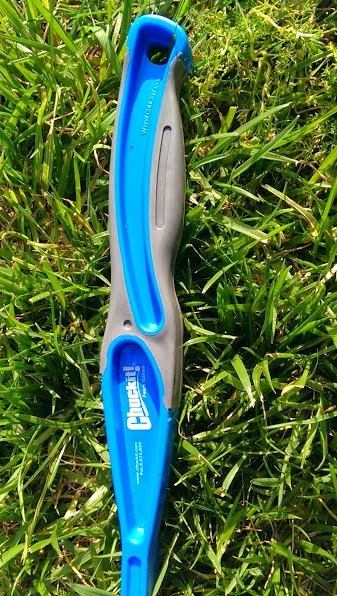 I have mild tennis elbow (I sound like a mess, I know, but I swear I'm in decent shape) from lifting weights, so when I saw my neighbor down the street using a ChuckIt! Ultra Tennis Ball Launcher, I knew I had to get one. A medium sized ChuckIt! Ultra Tennis Ball Launcher with "The Whistler" ball. The ChuckIt! Ultra Tennis Ball Launcher is affordable—currently $9.90 on our website. You don't have to bend over to pick up the ball! Just tell your little buddy to "drop it" (or whatever command you use) and use the ChuckIt! 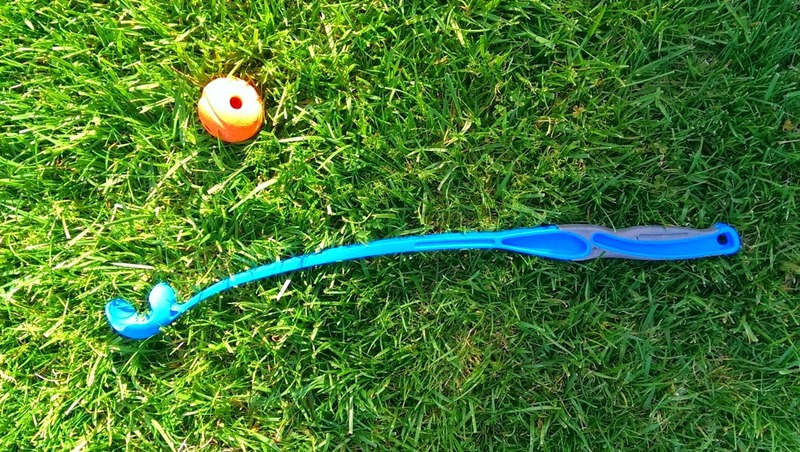 launcher wand to pick up the ball while standing. You don't have to touch slobbery balls any more! This is very useful for me because I don't want to carry baby wipes or hand sanitizer around in my pocket when I take my kid and dog to play. You can throw SUPER far with the ChuckIt! launcher. I have the medium size version, which measures 25" in length, and it's designed for long-range throwing. With minimal effort, I can fling a ball the entire length of the small park by my house. I can throw so far so fast, I sometimes worry that Benji didn't catch the flight trajectory and that I'll have to chase it down myself. I'd say I'm throwing about 3x further with the ChuckIt! than without it, which is precisely what the manufacturer, Canine Hardware, advertises. Using the ChuckIt! doesn't aggravate the tendonitis in my elbow, which was one of my main motivators for purchasing it. Just pull the ChuckIt! Launcher back and release earlier than a normal throw. To throw the ball super far, you don't need to expend much effort. 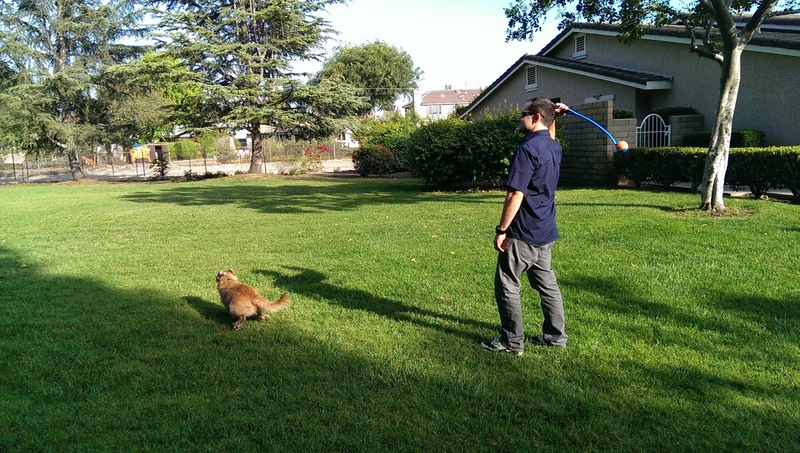 Just pick up a ball, pull the wand back and release earlier than you would a regular throw. Then look up and marvel as the ball flies into the stratosphere! My wife releases the ball a little late in the cool animated GIF at the top of this post, but she got a knack for it after a couple of tosses. My boy Benji is a tenacious chewer (see earlier post), so as a general rule I don't give him tennis balls. 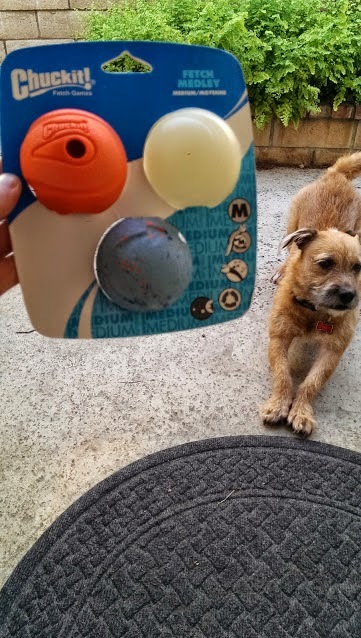 When he finds them at parks or in the backyards of friends and family, he'll literally rip them apart in about 10 minutes depending on the condition he finds the ball. This was precisely the reason I didn't immediately buy the ChuckIt! after seeing my neighbor using it: I just didn't know if the ball would last more than a day. Petmate Indigo Dog House in the background. 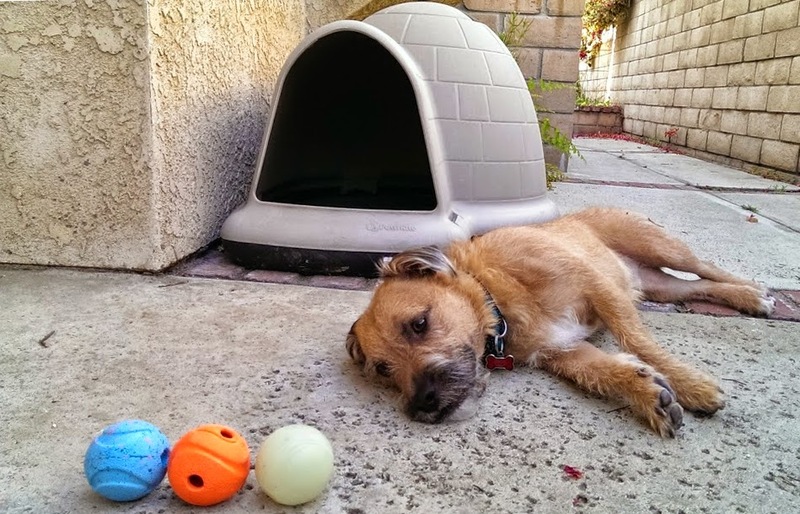 Fortunately, after doing a little research, I discovered that Canine Hardware, makers of the ChuckIt!, produce a bunch of different ball options you can opt for. The ChuckIt! Fetch Medley (and Benji). I ordered the Chuckit! Fetch Medley of medium balls for $12.47 from our store. I knew I made the right decision to buy the balls the instant I opened up the shipping box. The balls are far sturdier than the tennis ball that comes packaged with the ChuckIt! Launcher. Although the 3 balls in the Fetch Medley are meant for—you guessed it: fetch—they each have a bonus feature, which made the purchase a little more satisfying for me and a little more fun for Benji. The orange ball is called "The Whistler" and it twitters and whistles while in flight. 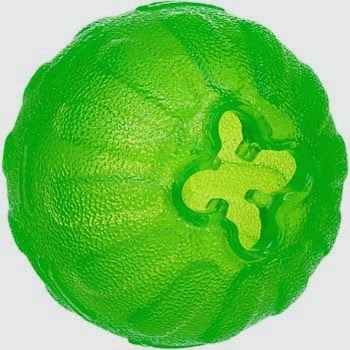 It's made of natural rubber and can be cleaned in your sink, unlike the included tennis ball. The semi-transparent ball is called "Max Glow." If you place it under any bright light source (the sun, a lamp, etc. ), it will "illuminate" with a bright, long-lasting glow if you take it into the dark (no batteries required). 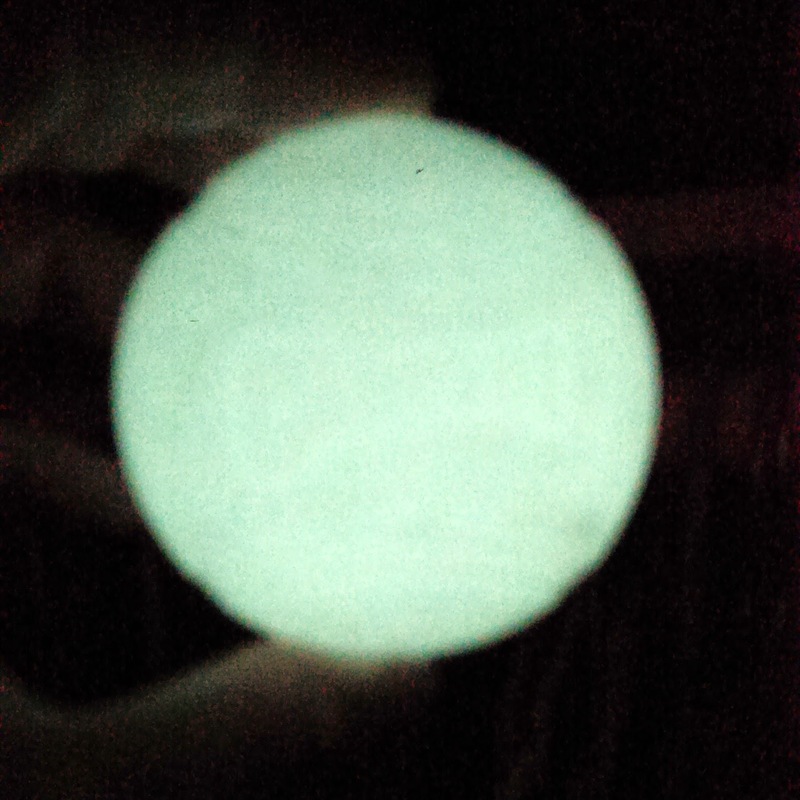 The glow in the dark Max Glow ball for the ChuckIt! Ball Launcher. After spending no more than 10 minutes in the daylight (at 5 pm, so the sun wasn't directly overhead), I walked into my closet with the Max Glow in hand and it glowed like the Sting Sword in The Lord of the Rings. I took a (not great) photo with my cell phone so you could see what it looks like in the dark. This opens up a whole new world of play for Benji and I on those evenings when I arrive home from work after the sun sets. The Rebounce Ball in the Fetch Medley for the ChuckIt! Ball Launcher. 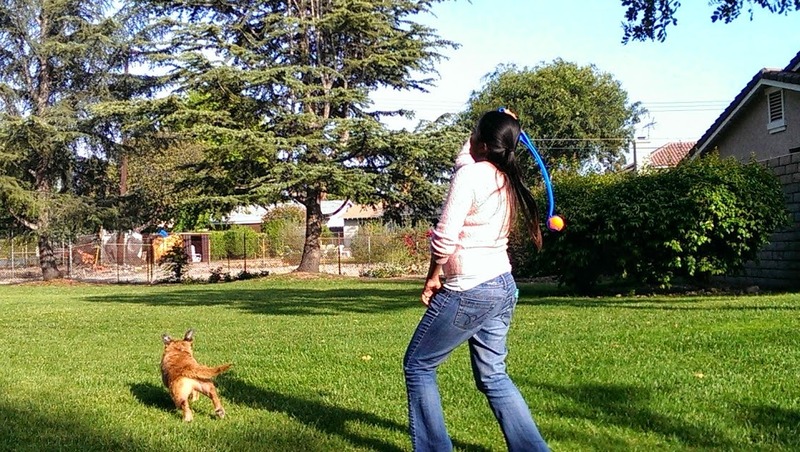 The last ball in the Fetch Medley is the blue "Rebounce Ball." Like the name suggests, this ball has hops. If you were at a school playground for instance, you can bounce this thing off the asphalt to wondrous heights. My dog has a particular knack for catching balls after they bounce (it's his "thing"), so I think we'll find this ball particularly useful for play in my backyard since I have a lot of concrete. All 3 balls in the Fetch Medley have holes inside them, so if you wanted to tie a rope through for tug of war or other types of play, you totally could. Benji has other toys that serve that function, so I'm unlikely to do it myself, although the balls are so durable the manufacturer probably thought "Hey, why don't I punch some holes in these to make them more versatile?" Benji retrieving the tennis ball that comes with the FetchIt! Ultra. All in all, I couldn't be happier with my most recent PetStore.com purchases. Thanks to the ChuckIt! Ultra Tennis Ball Launcher, I won't have to bend over to pick up slobbery balls anymore when I play fetch with Benji. I'll also be able to throw further, giving my dog a better workout, and I won't have to work as hard to do so—which should give my tennis elbow more of an opportunity to heal. Last but not least, the Fetch Medley, at least in my case, is an essential accessory. Benji prefers to carry his ball with him when we walk to the park and I don't always remember to put it away immediately after we arrive home from play. In other words, he gets slightly unsupervised chew time. The Fetch Medley provides me with a level of relief because I don't have to worry about Benji destroying them and choking on the pieces, like he might with a tennis ball. I also dig the idea of getting in evening play with the Max Glow ball. After a walk to the park, 15 minutes of play and a walk back home, Benji was pooped! 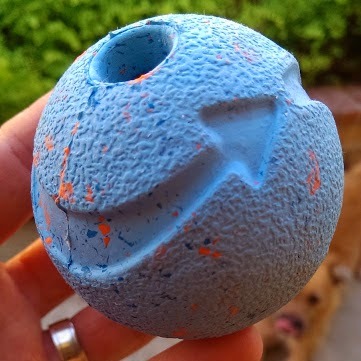 If you're tired of bending over and touching slobbery balls... if you don't have the best throwing arm or suffer from tennis elbow like I do... if you want to play ball after dark: do yourself a favor and pick up the ChuckIt! Ultra and Fetch Medley pack. You can thank me later! To explore more ChuckIt! Launcher sizes, styles and ball options, click here. Why is it good to brush your dog? Brushing your dog with a dog brush removes dead hair from the coat. 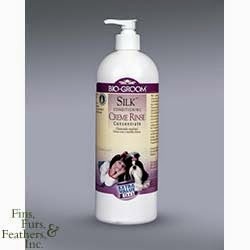 This is particularly beneficial for long-haired breeds to prevent matting. Brushing also stimulates your pet’s skin as well as helps with moving the natural oils throughout your dog coat. 1. Make sure to brush your dog to ensure all of the mats are out before bathing. If your dog still has tangles, when its fur gets wet, the fur tends to mat up more. Water even tightens the mat and then you leave room for shampoo getting caught in the mat causing a challenge on rinsing out the shampoo. 2. If your dog has very tangled fur, you may wish to dampen the fur and add some conditioner or leave-in conditioner for a few moments before brushing. This may make it easier on you and your pet. 3. 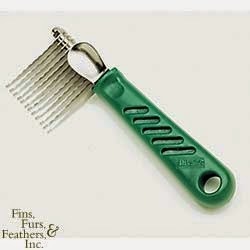 Brushing your dog’s hair layer-by-layer will help ensure that you are pulling the least on your dog’s skin. 4. Brushing your dog’s head last will aid in the process. 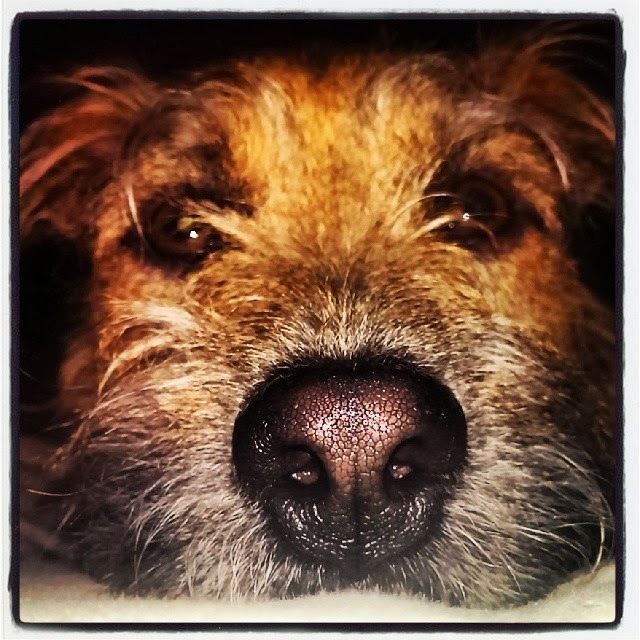 Go for areas that they cannot see first as the head is a sensitive area for most pets. You want to keep your pet comfortable for as long as possible. 5. The final step is to go through your dog’s coat with a fine-toothed comb to ensure that there aren't anymore mats in the coat. 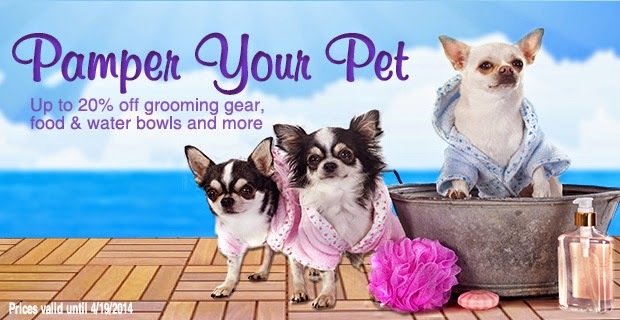 We've got pet grooming gear on sale this week plus some super-cool food and water bowls marked down up to 20%! 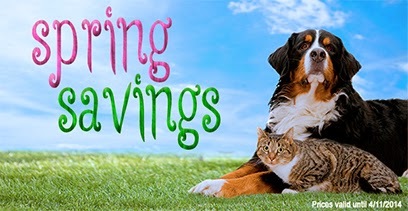 Save up to 30% in our Spring Sale! Score a cute cat condo, handy collapsible food/water bowls or the ultimate guidebook on how to care for and cultivate corals! Click here to see what's on sale this week! My terrier Benji is a tenacious chewer and recently figured out how to rip apart his favorite Kong Stuff-A-Ball after a year of use (far longer than most of the toys he plays with regularly last). I found an alternative, though: the Triple Crown Everlasting Fun Ball. It has a completely different texture than the Kong ball but can still be stuffed with treats that get dispensed while he plays. He's had the ball in his mouth every day since Christmas and I see no signs of wear. 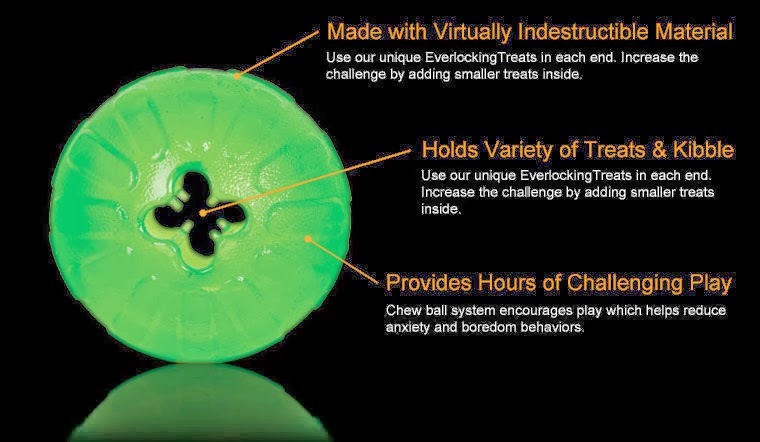 The Everlasting Fun Ball can be filled with food, treats or any snack your dog enjoys. It is dishwasher safe (in the top rack) for easy clean up. 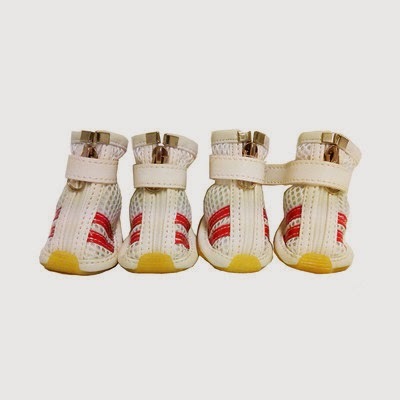 It is completely free of latex, vinyl and phthalates. If your dog is a strong chewer, go with the large size. If your dog is a strong chewer, we recommend selecting next size up. 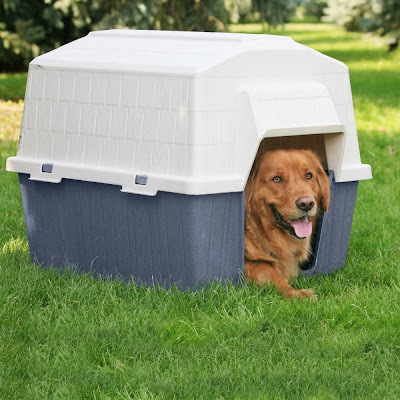 Win a Petmate Barnhome Dog House! The Barnhome is a barn-shaped dog house that protects your dog from the hot or cold outdoor elements. It features a rear air ventilation system to promote air circulation, an extended rim on the roof to divert rain and raised interior flooring to kelp keep your pet dry. Want to keep your dog warm in the winter and cool in the summer? ENTER NOW. Registration ENDS at 11:59 PM PST on 12/27/13. Details: Open to US residents 18 years or older. Void where prohibited or restriced by law. Winner will be contacted via email. Score your sporty sidekick some sweet sneakers for as low as $12.49!